The Native American story of Spotted Tail. Learn about the culture, stories, myths and legends of American Indians and their famous chiefs and tribes. A Native American Story of Spotted Tail to teach kids about Native Indians in a short, enjoyable, easy to read format. 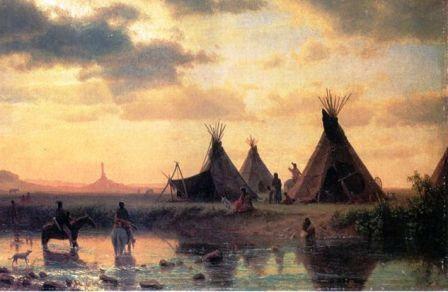 Among the Sioux chiefs of the "transition period" only one was shrewd enough to read coming events in their true light. It is said of Spotted Tail that he was rather a slow-moving boy, preferring in their various games and mimic battles to play the role of councilor, to plan and assign to the others their parts in the fray. This he did so cleverly that he soon became a leader among his youthful contemporaries; and withal he was apt at mimicry and impersonation, so that the other boys were accustomed to say of him, "He has his grandfather's wit and the wisdom of his grandmother!" No sooner had the Oregon Trail been secured from the Sioux than Fort Laramie and other frontier posts were strengthened, and the soldiers became more insolent and overbearing than ever. It was soon discovered that the whites were prepared to violate most of the articles of their treaty as the Indians understood it. At this time, the presence of many Mormon emigrants on their way to the settlements in Utah and Wyoming added to the perils of the situation, as they constantly maneuvered for purposes of their own to bring about a clash between the soldiers and the Indians. Every summer there were storm-clouds blowing between these two—clouds usually taking their rise in some affair of the travelers along the trail. The soldiers recaptured the horses without any loss, but Spotted Tail still followed the Indians. When they returned to the fort without him, everybody agreed that he would never turn up. However, next day he did "turn up”, with the scalp of one of the marauders! "'Hay, hay, hay! Alas, alas!' Thus speaks the old man, when he knows that his former vigor and freedom is gone from him forever. So we may exclaim to-day, Alas! There is a time appointed to all things. Think for a moment how many multitudes of the animal tribes we ourselves have destroyed! Look upon the snow that appears to-day—to-morrow it is water! Listen to the dirge of the dry leaves, that were green and vigorous but a few moons before! We are a part of this life and it seems that our time is come. "Yet note how the decay of one nation invigorates another. This strange white man—consider him, his gifts are manifold! His tireless brain, his busy hand do wonders for his race. Those things which we despise he holds as treasures; yet he is so great and so flourishing that there must be some virtue and truth in his philosophy. I wish to say to you, my friends: Be not moved alone by heated arguments and thoughts of revenge! These are for the young. We are young no longer; let us think well, and give counsel as old men!" These words were greeted with an ominous silence. Not even the customary "How!" of assent followed the speech, and Sitting Bull immediately got up and replied in the celebrated harangue which will be introduced under his own name in another chapter. The situation was critical for Spotted Tail—the only man present to advocate submission to the stronger race whose ultimate supremacy he recognized as certain. The decision to attack Fort Phil Kearny was unanimous without him, and in order to hold his position among his tribesmen he joined in the charge. Several bullets passed through his war bonnet, and he was slightly wounded. The Native American Indian Story of Spotted Tail provides an opportunity to read about the life and times of Native American Indians and many of their great chiefs and famous leaders. A Classic Short story about Spotted Tail for kids and children of all ages. This short story of Spotted Tail is great to read to kids and children at bedtime. This very short story contains folklore about the famous people of Native Indian tribes. This short Native American story has been selected to keep the attention of kids and children of all ages. Many of the traditional stories featured in this section are true and others are folk stories or myths and legends. Read our free short story online about Spotted Tail. Read a free, online short story about the people of famous tribes Native American Indians to increase knowledge and understanding of the indigenous people of North America. The Story of Spotted Tail. Discover the vast selection of pictures which relate to the Stories, History and Culture of Native Americans. The pictures show the clothing, War Paint, weapons and decorations of various Native Indian tribes that can be used as a really useful educational history resource for kids and children of all ages. 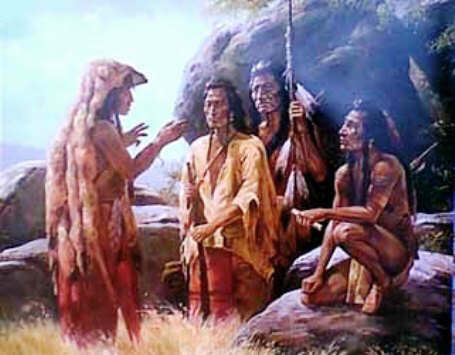 We have included pictures and videos to accompany the main topic of this section - The Native American story of Spotted Tail. The videos on this website enable fast access to the images, paintings and pictures together with information and many historical facts. All of the articles and pages can be accessed via the Native Indian Tribes Index - a great educational resource for kids.